A Howell torpedo was found by US Navy dolphins around Coronado Island, San Diego in June of 2013, while on a mine finding exercise. Two interesting things about that news item, for one, dolphins turn out to be a lot better at finding mines than our current technology... and the other, they found a Howell torpedo, one of only 3 known in existence. The Howell torpedo was an early competitor to the Whitehead torpedo, but was significantly better in some ways, but had it's own limitations. For propulsion, the Howell used a flywheel, which was spun up on board the ship before firing. One of the benefits of the flywheel was one of the drawbacks of the Whitehead at the time, the flywheel acted as a sort of gyro, keeping the torpedo on course. The effect on the torpedo from wave action only caused the torpedo to roll, not alter it's course, and that was compensated for by it's rudders. Whitehead had significant problems keeping his torpedo on course, which he eventually solved by buying the rights to gyroscope gear, and suing Howell out of existence. The Whitehead used compressed air for propulsion and was silent compared to the noisy flywheel of the Howell. However the Whitehead left a wake, that the Howell didn't. 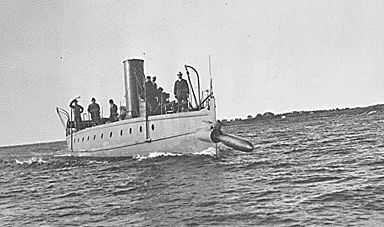 In the end, only 50 Howell torpedos were built. The US Navy dropped the Howell in favor of the Whitehead, as did most modern navies at the end of the 19th Century. The Howell was no pushover at the time, it could run straight, had a range of 400 yards (twice the Whitehead) and carry a 100 pound warhead. It the torpedo was fired in anger and missed it's target, a water soluble patch would dissolve over the primer, rendering the torpedo inert. But the best part was the body of hard rolled brass, a sight appreciated by the likes of Jules Verne.